Yacht Broker Brent DeSellier : Atlantic Yacht & Ship, Inc.
With hard-earned savings, Brent bought his first boat at the age of 12. Needless to say, it re-defined the term “fixer-upper”! His love of boating blossomed, and he has been on the water ever since. He spent his younger years boating in New England waters while docked in Old Saybrook, CT, and he still enjoys cruising around Long Island sound in the summertime. As destiny would have it, Brent is now based in the yachting capital of the world with his wife, Brianne. He is familiar with both local Floridian cruising and the rejuvenating tropical waters of the Bahamas. He also enjoys scuba diving whenever possible. While attending the University of Miami, Brent submerged himself in the luxury yachting industry with part-time and internship work. As would be expected, upon graduating he went directly into the yacht brokerage business. In addition to his experience with the domestic market, Brent has also facilitated exports to Europe and Japan. Along with fully utilizing the time-tested techniques of traditional yacht brokerage, Brent’s command of state-of-the-art internet marketing technology provides superior exposure in today’s changing marketplace. Brent is an active member of both the Florida Yacht Brokers Association and the Young Professionals in Yachting organization. He also serves on the board of directors for the Freedom Waters Foundation. 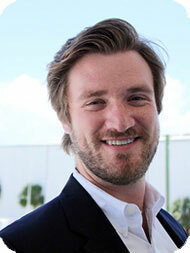 As a broker at Atlantic Yacht &Ship, Brent confidently guides his clients through either the buying or selling process. His expertise, integrity, and energy consistently yield positive results, and his strong customer service orientation and caring approach build long-lasting friendships.